The ultra sleek 2020 Lexus RC F and Track Edition have just hit the NAIAS 2019 show floor, complete with a few upgrades over its predecessors. The Track Edition includes: Brembo-sourced carbon ceramic brakes and lightweight 19-inch forged BBS wheels. Both models sport a 5.0-liter V8 engine generating 472 hp and 395 lb-ft of torque, good for a 0-60 time of under 4-seconds. You can select from either an Ultra White or Matte Nebula Gray exterior colors, while a red leather interior with red carbon-fiber accents comes standard. Read more for an up-close video and additional information. 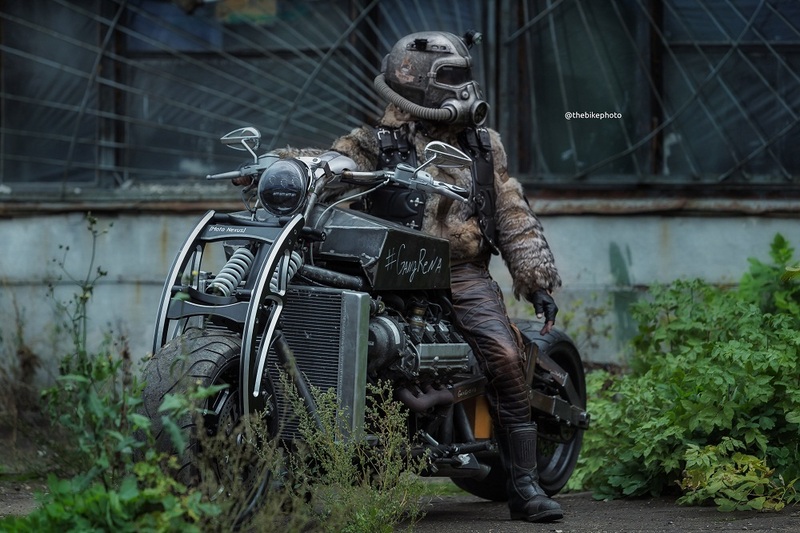 A motorcycle enthusiast from Yekaterinburg, Russia decided to build a Fallout-inspired “Crazy Bike” this past summer, and it’s a doozy. The idea first came to him when he saw a V8-powered bike from a US-based builder, but didn’t quite like how it looked. “It’s a 300 hp engine…we wanted our bike to be really nice, but we also had to put it in in a way that doesn’t make the bike longer than 3 meters to stay road legal,” said its creator. Read more for additional pictures and information. If Lexus turned its LFA supercar into a sport yacht, this is what it would look like, or so we think. Imagined by the Lexus Design Center and built by Marquis-Carver, this luxurious 42-foot, eight passenger yacht is powered by a pair of 5.0L V8 engines that generate 880 hp combined, enough to hit a top speed of 43 knots. CFRP construction ensures it remains light when compared to fiberglass competitors, while the cockpit boasts a color touchscreen that lets the pilot monitor and control all aspects of the ship. Click here to view the first image in today’s viral picture gallery. Continue reading for the five most popular viral videos today, including one of Magneto’s seven secret superpowers. Lexus covered their all-new 2017 IS in 41,999 configurable LEDs for Dua Lipa’s “Be the One” music video, and it’s a work of art. All of the lights were installed by hand onto the exterior, turning it into a giant programmable screen that can be used for light shows, as well as animations. “A car as visually striking as the LIT IS required an equally dramatic debut. A music video was a perfect place to launch the LIT IS and working with Dua Lipa allowed the concept to come to life, putting a spotlight on the Lexus IS in an entirely new way,” said Lexus general manager of product and consumer marketing Brian Bolain. Continue reading to watch the music video, a behind-the-scenes featurette, and for more pictures. Set to make its official debut at the Paris Motor Show this weekend, the Lexus Kinetic Seat Concept features an innovative fiber net construction, rotational seat cushion and back rest movements, along with a a flexible spider web-pattern for optimal support. The rotational seat cushion and back rest enables both sections to move kinetically with the occupant’s weight / external forces, thus stabilizing head movement caused by vehicle motion and keeping your field of vision steady. Click here to view the first image in this week’s art of trolling gallery. Continue reading for a viral video of the amazing technical mastery of Formula One drivers. Lexus says that the skilled man and women (known as Takumi) who work on the production lines hone their dexterity skills by folding origami models using their non-dominant hand. To show their level of talent, Lexus commissioned their best workers to build a functional Origami Car. That’s right, this paper car has everything a regular vehicle would, including functioning doors, headlights, and rolling wheels. The electric motor mounted on its steel and aluminum frame enables on to drive it around, albeit not on real roads. Continue reading for a making of video, more pictures and additional information. Lexus has just released a new video teasing their SLIDE Hoverboard, saying that it’s like “floating on air”. This device flies using magnetic levitation, which relies on high-powered magnets and semiconductors, both of which are cooled by liquid nitrogen. Why did they create this hoverboard? Well, the company says it’s working on bringing this technology to its cars. Continue reading for the video (plus the original) and more information. Yet another real-life hoverboard has been unveiled, and this time, it’s the Lexus SLIDE. In a newly released video by the company, SLIDE seems to be levitating in a skate park, which suggests the flooring is made of concrete. A company representative says: “The Lexus Hoverboard uses magnetic levitation to achieve amazing frictionless movement. Liquid nitrogen cooled superconductors and permanent magnets combine to allow Lexus to create the impossible.” Continue reading for the video and more information. We have seen the future of ultra compacts, and it includes the Lexus LF-SA (Lexus Future-Small Adventure). This concept not only has a body that Lexus says will “change perceptions when viewed from different angles,” but an infotainment system on the inside includes a hologram-style digital display incorporated in the instrument binnacle and a wide-angle head-up display. Continue reading for another video, more pictures and additional information. This Lexus LF-LC in electric blue is the company’s most powerful hybrid yet, sporting an Advanced Lexus Hybrid Drive that’s rated at 500 horsepower. Plus, it boasts an advanced smart battery pack and lots of carbon fiber. Continue reading for a video, more pictures, and additional information.